Choose from our massive range of different e liquid flavours at one low price. Here you can choose from our different multi buy cheap e liquid deals, then you can select a specified nicotine strength that suits your vaping needs. 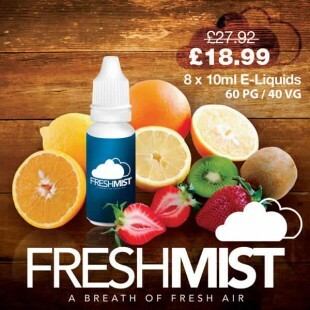 Our Fresh Mist E Liquid flavours are a 70/30 ratio 70% PG and 30% VG. All our ingredients are UK sourced and manufactured in our own white lab based in Manchester.